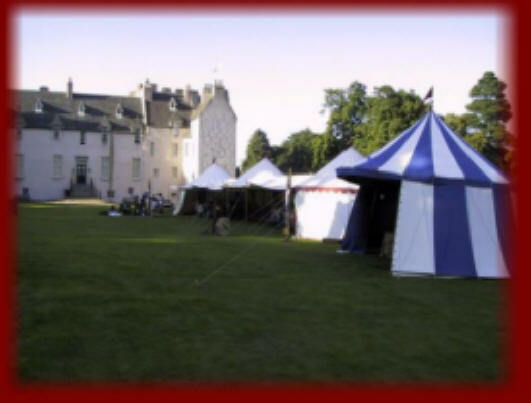 Drum castle in Aberdeen was chosen as the ultimate venue for Harry and Pauline Brechine. 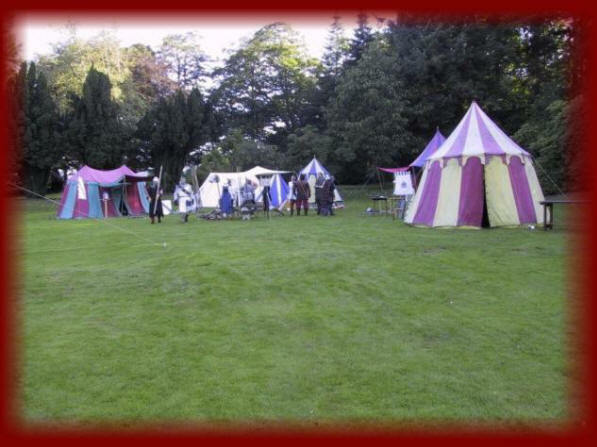 They wanted their medieval banquet inside a large medieval tent and wanted all the guests to be able to participate in activities before the banquet. 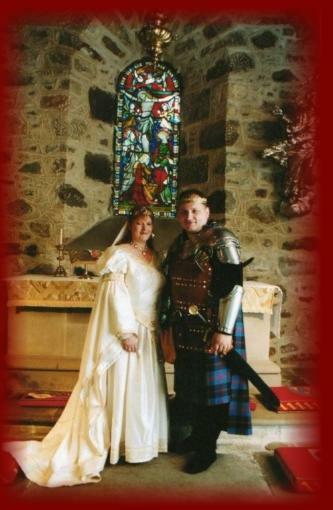 When they found drum castle they realised this was the right venue to have their dream wedding day With it's medieval chapel in the grounds they had found somewhere which would enable them to have everything they wanted. Pauline and Harry were very excited about finding Fantaysia as they knew that the kingdom would be able to make their day the way they had dreamt it to be -a fairytale medieval wedding. From the minute they arrived and saw all their excited guests dressed in medieval costume they knew they were about to have a very special day, and again they had one of the hottest days of the year. 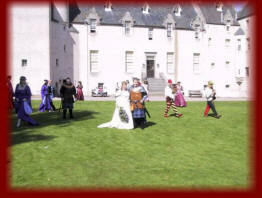 Harry arrived in his armour and kilt and Pauline looked beautiful in her accolade designed wedding dress. After they took their vows in the medieval chapel they were met by men at arms crossing their swords in a guard of honour. From then on they had an amazing day full of archery. 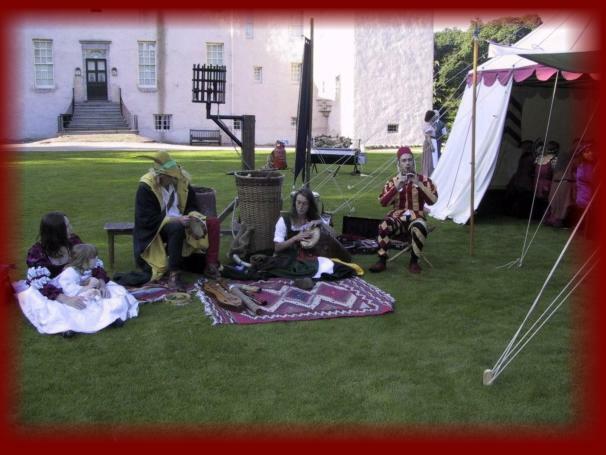 falconry, sword fighting, fully themed banquet, medieval music and the royal jester juggler. 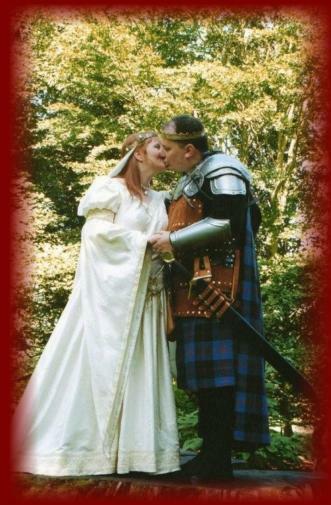 Their hand fasting ceremony was performed with them stood upon the base of one of the oldest trees at drum castle set in the forest with their friends and family surrounding them. Their night ended with a medieval music and drinks from the black rat tavern. The braziers burnt through the night and the guest were entertained with a fire show, and everyone commented on how it was the most amazing wedding day they had ever been a part of. Pauilne and Harry's comments were.